I am in no way shape or form a Nascar guy, but last night I watched a Nascar race that was genuinely amazing. And here are the highlights of Eldora, Nascar's first top-level race on dirt since 1970, in animated, infinite-looping gif form. The best thing about the dirt track race was that you could see just how hard everyone was working behind the wheel. The trucks were sliding across the full width of the track to make passes, drivers were grinding on the wall just to keep themselves pointing forward, and this was all happening in two-, three-, four-, or sometimes five-wide packs of cars. And a good chunk of the field had very little experience racing on dirt, which explains why the opening of the race looked slightly less coordinated than rush hour traffic in Mumbai. Even getting into the race was nuts. The above clip is from the last chance qualifying heat just to get into the main event. 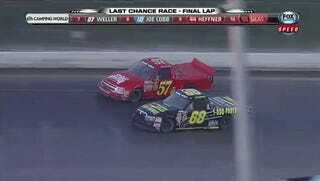 Driver Norm Benning in the red truck literally squeezed himself into the big race. Naturally, Benning gave the offending driver the finger. 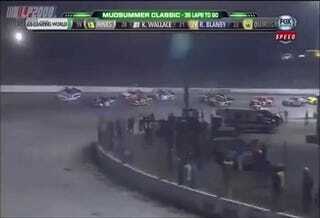 The real thrill of the race was watching 20-year-old Asian-American dirt track phenom Kyle Larson obliterate the field, make a single mistake, and then try and fight his way back to the top spot. Above is Larson in slow-mo, trying in vain to re-pass Austin Dillon after Larson was making his way through lapped traffic and bumped into the back of another truck. Dillon and Larson are side-by-side, sideways, and touching. There were a few restarts that screwed Larson over for the race. One of them was caused by the sole crash of the whole race. You can see how it starts above and how it resolves below. 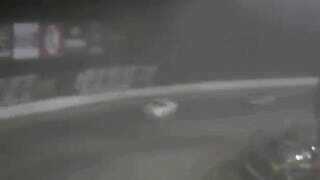 Yep, one driver proves that going sideways isn't as easy as Larson makes it look, sliding into the wall and losing it. He spins into the pack and a yellow flag comes out. But that only made Larson work harder to make it to the top spot. 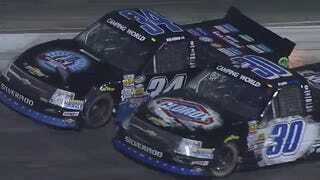 After a few bad starts, Larson was stuck behind his own teammate Ryan Newman and did everything he could to get past. Here he is pushing Newman into the wall to get up into second with barely more than a lap to go. And they both come out of the turn completely sideways. 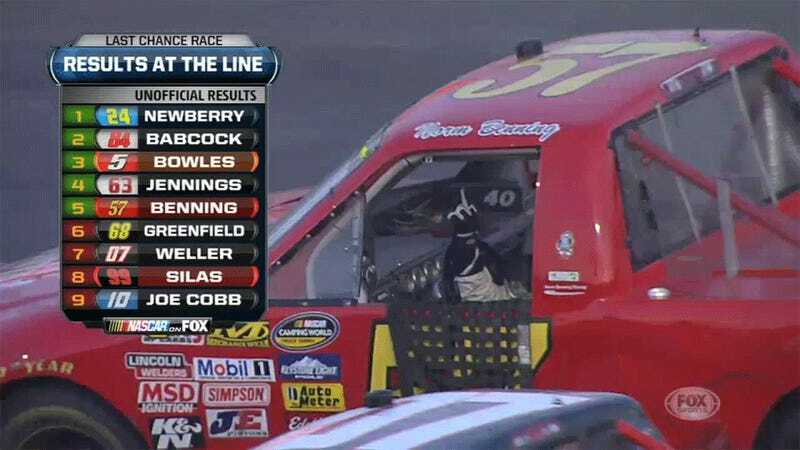 Newman told reporters after the race, "I told Kyle I needed his mailing address, cuz I'm wanna mail him the left side of this truck." 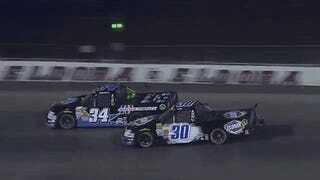 Larson was overdriving his truck as much as he could trying to catch up on Dillon, but he just couldn't make ground. How much was he overdriving? 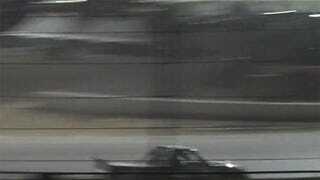 Check out how he's shooting sparks off the back of his truck, oversteering into the wall in the final turn. But time ran out and Dillon was the winner. 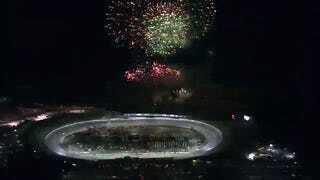 So it all ended in fireworks, as any big Ohio night dirt track race should. Now I'm just wondering why it took so long for Nascar to come back on dirt.